Just 10 miles from Scotland’s coast lay the prehistoric village known as Skara Brae. This 5000-year-old Neolithic settlement is nestled in the Orkney Islands. The name means “Cormorant Mounds” and is known as the “Pompeii of the North.” The site, partially discovered after a virulent storm in 1850 and later erosion in 1924, was inhabited from around 3200 to 2200 B.C.E. The people of Skara Brae numbered probably no more than 50 to 100 at any given time and lived together in just six or eight mounds made from stone material connected by covered passageways. The passageways were made of stone, including the top slabs, just over three feet in height, covered by animal bones, shells and refuse called midden. Archaeologists surmise that the self-sufficient farmers lived an egalitarian, ritualistic lifestyle based on mandates of nature, earth and sky. Although there are no written records testifying to their religious beliefs, the site shows that they revered the dead and placed them in sanctified tombs for worship and community ties. The chambered cairns or tombs, dwellings and furniture were made of the available flagstone on the islands, as timber was in short supply as soil conditions were not optimum for tree growth. The stonemasons of Skara Brae were also functional artisans. The layout and style of the homes and the furniture suggested that status didn’t lie in worldly possessions. There was likely no wealth, class or power stratum among Skara Brae’s people. The uniformity of the furniture layout suggests that not only was the furniture placed in positions of significant use but of symbolic ritualism—perhaps the prehistoric equivalent of Feng Shui. The stone furniture consisted of cupboards, bureaus and beds laid out with the fire-burning hearth in the center of each home, flanked by beds. The beds were box-like with the larger one on the right and the smaller one on the left. Right is considered patriarchal, even in modern times, and it stands to reason that the right side was for the male of the household, the left for the female. The right side of the dwelling also seemed to be for the males to congregate as there was a stone barrier directing visitors to that direction. The left side seemed to be relegated to domestic chores, which would have been taken by the female. The stone storage units, or dressers, faced the entrances and visitors saw them upon entering. There was often a stone block between the hearth and the dresser. Archaeologists think that perhaps it was a place for visitors to sit or maybe it was for the head of the household. 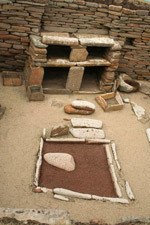 The hearth may have been the center of each dwelling’s culture. The Orkney Islands are near enough to the Arctic Circle that winters would have been long and dark. The central hearth was likely as much like a gathering place as today’s kitchens, patios and living rooms are. Folks sat around telling stories, making music and discussing the relevant items of the day. Hearths are like fireplaces in modern homes, the focus of the room. 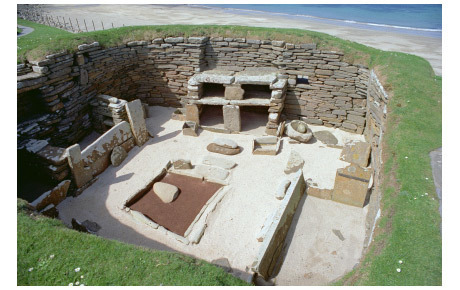 For Skara Brae residents, it was a place to cook and to keep warm, to survive. Skara Brae remains a conundrum to many archaeologists and historians. With no written records, they are left with only theory about the life, stone furniture, placement, symbolism and ritual of the villagers. Their lives seemed steeped in simplicity, yet complex in reason. They made use of their immediate surroundings, stone and washed-up sea life. The lifestyle would have been as hard as the stone furniture they sat on, but the villagers deep sense of self and of their ancestry likely kept them focused on daily survival and the rituals that enriched their lives. No villager seemed to have lived for than three or four decades and most probably died long before they became young adults. Remains weren’t segregated among the tombs, but combined together, perhaps as family or maybe as generational tombs. Life in Skara Brae, so well preserved under sand for 5,000 years, is listed as a UNESCO World Heritage Site. The villagers' lifestyles, their homes, their cairns and their furniture is most preserved in house seven at the archaeological site. fabric upholstered bedModern elegance meets funky retro designer styling in the classic-yet-casual upholstered headboards and beds. Choose from a variety of styles and colors to find the perfect piece for your good taste. carpentry furnitureThis article is a wealth of knowledge about the history, business and career of carpentry. 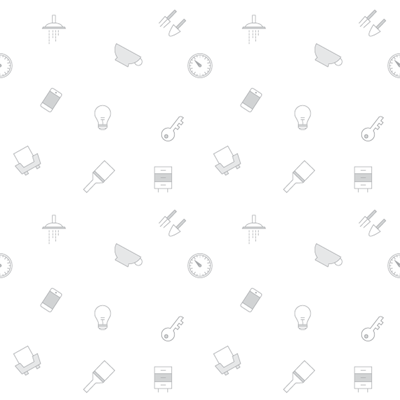 Read on to discover a large number of links to informative sites that are of interest to novice and seasoned carpenters alike. victorian style bedroom furnitureChoosing to style your bedroom in a specific theme can greatly alter the atmosphere of your bedroom. Using bedroom furniture that is inspired from the French Victorian Era is a great way to add grace and elegance to your bedroom. This article covers the features and design elements that helps create a French Victorian era influenced bedroom. Read on to find out how to choose the right type of bed and furniture pieces for your bedroom. Skara Brae is a prehistoric settlement ten miles of the coast of Scotland. This neolithic village has revealed a large number of treasures including what appears to be mankind's first use of furniture. 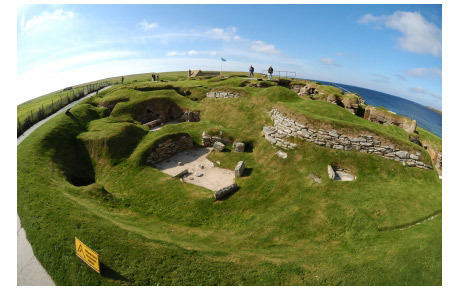 Read on to discover the fascinating story of skara Brae and what it can teach us about prehistoric civilization.